A little scrub radius helps you get feedback into the steering wheel to feel what your front tires are doing. I'm running 10 degrees, and an 1/8 toe in-the car handles like it's on a string. That's what I need to hear, thanks 38flattie. 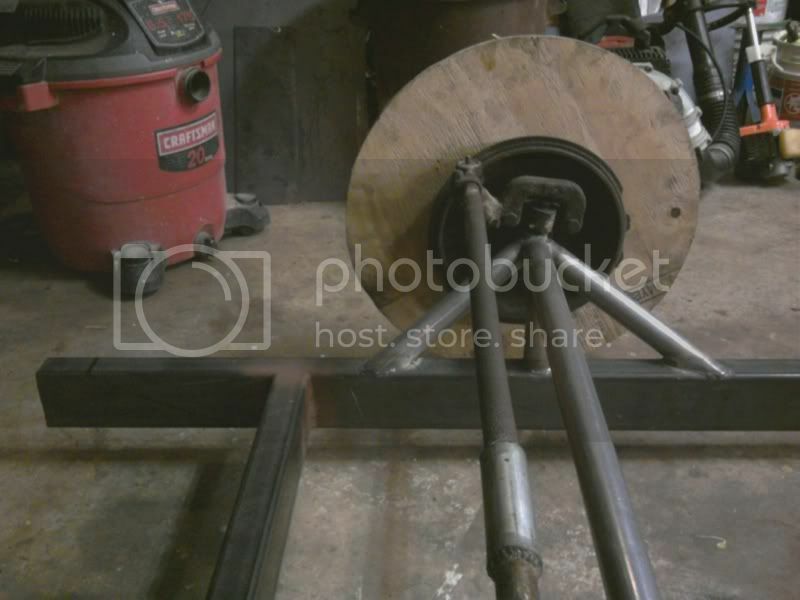 Had a bit of a set back today, there's no way aluminum rods are going to fit, so now I have to find custom steel rods that wont break the bank and take forever to make. 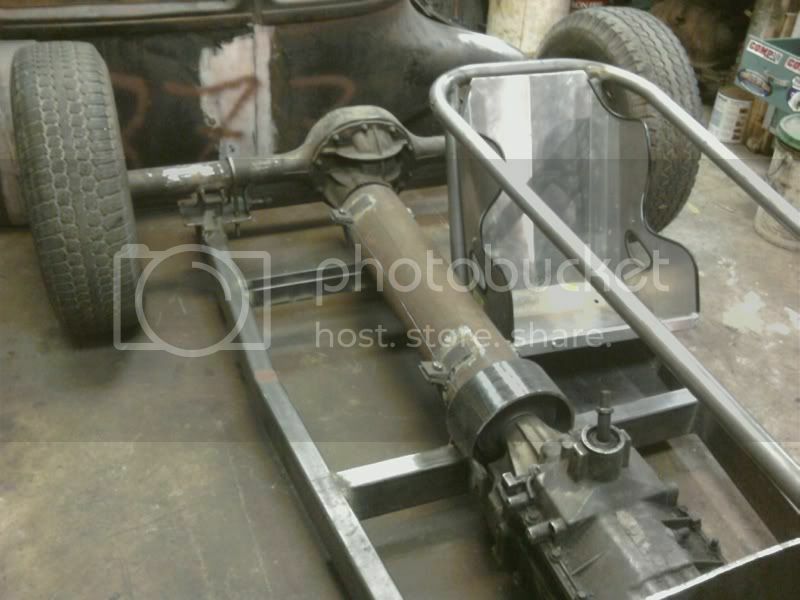 On a good note though, I found a local shop that has an 1 5/8 tube bender and got the first hope made for the roll cage. 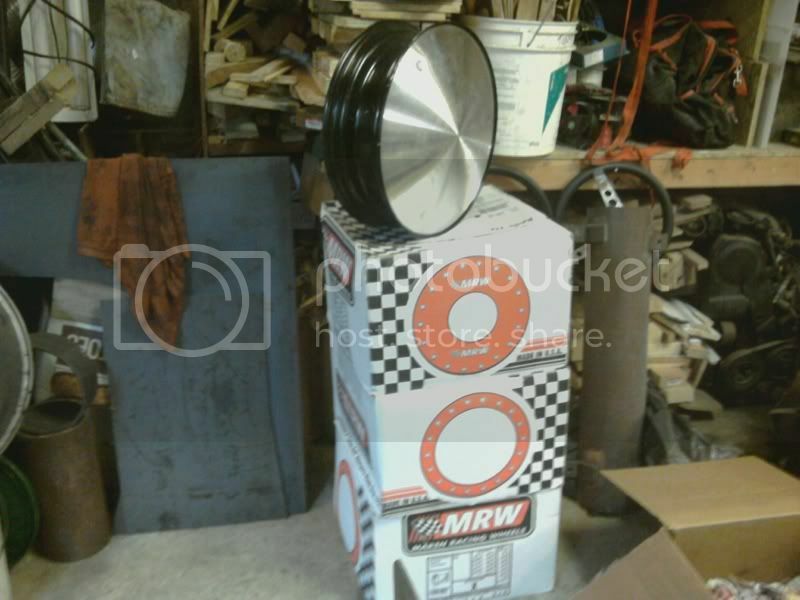 I also got ahold of a 6 inch diameter, 5/16 inch wall tube that I plan on using as a drive shaft container. That will give me plenty of clearnace between myself and 6,000rpm of steel. Its getting pretty tight in the cockpit. 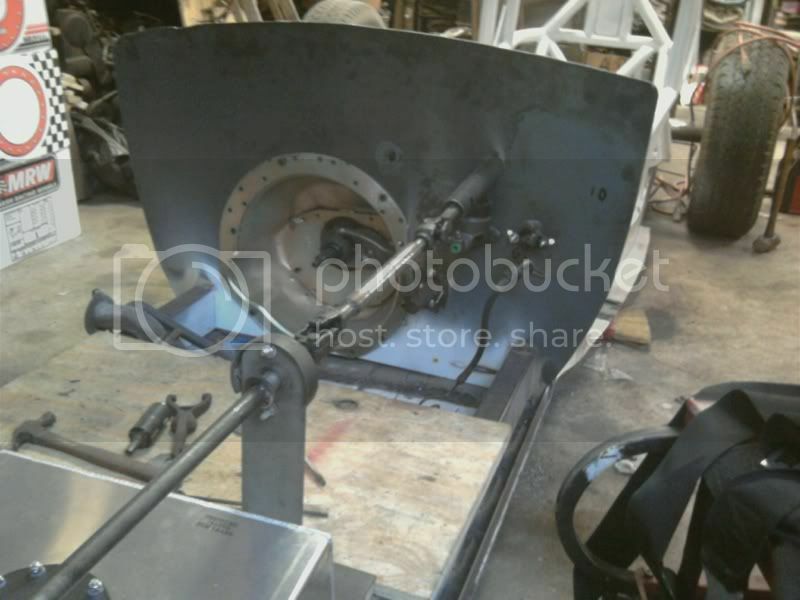 Still need to get ahold of fire suppression system, fuel tank and a water tank. Any recommendations on quality products? Joe Timney at Delaware Chassis Works is the closest to you for safety gear and advice. Call him before you go any farther. 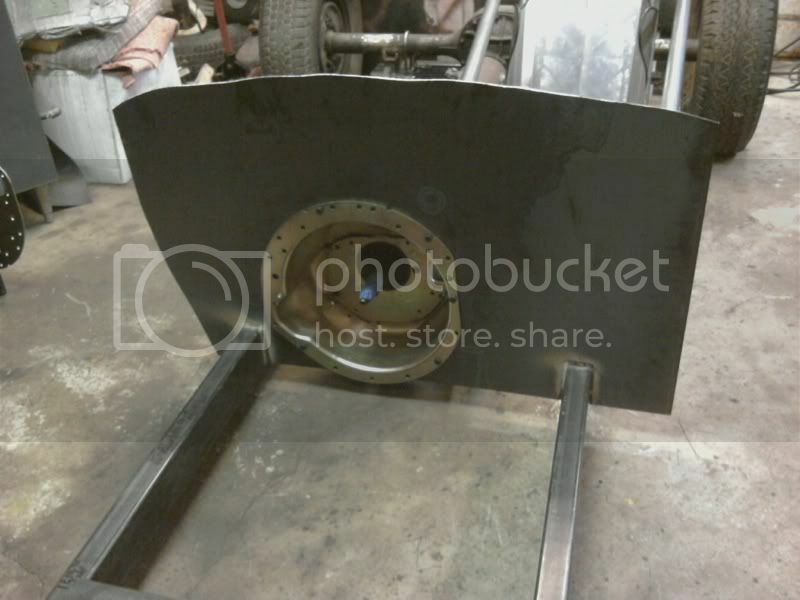 How big of fuel tank do you need? I have a 20 gal. tank just used at B'ville year, and a new 3 gallon tank. Thanks for the contact Tman, I'll try to get ahold of him for advice on proper safety equipment. Give Joe T. a couple of days as they just got back from Ohio running the first ECTA event there. It was wet, it was cold and it was great. Joe and the rest worked thier tail off. Ok got a few updates. I've been kinda spread out over the whole vehicle doing a lot of welding to get things solid and safe. 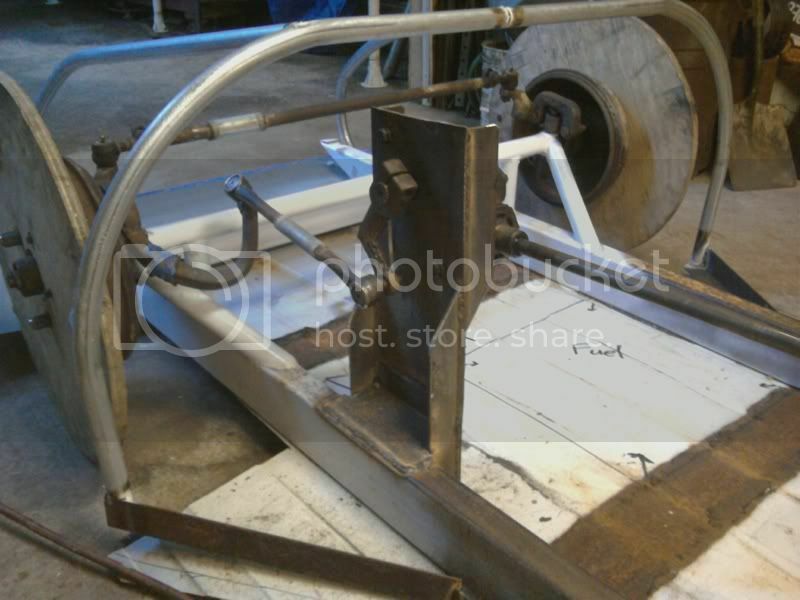 First I got the front end welded into place. I know there has been a lot of controversy over running sprung or solid, but I went with solid for simplicity and time. 8 degrees caster, no camber and a hint of scrub. 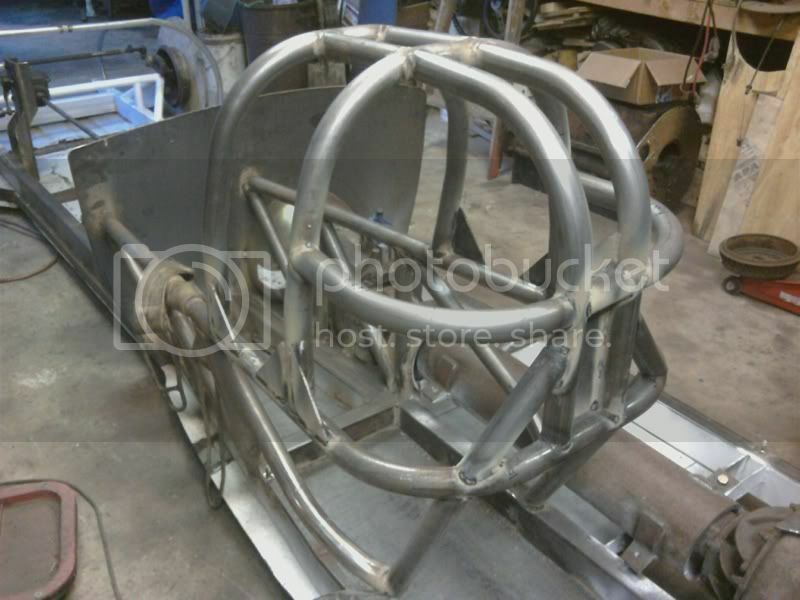 Next is the firewall, its 3/16 steel and holds the SFI bell housing very tight. I am feeling very comfortable that the straight six Jimmy wont torque itself out of the vehicle. Plus it allows me to pull the engine very easily if needed. Its only roughed out right now and when I get some more time it'll have a much better shape. And finally, I have been pretty busy behind the firewall. 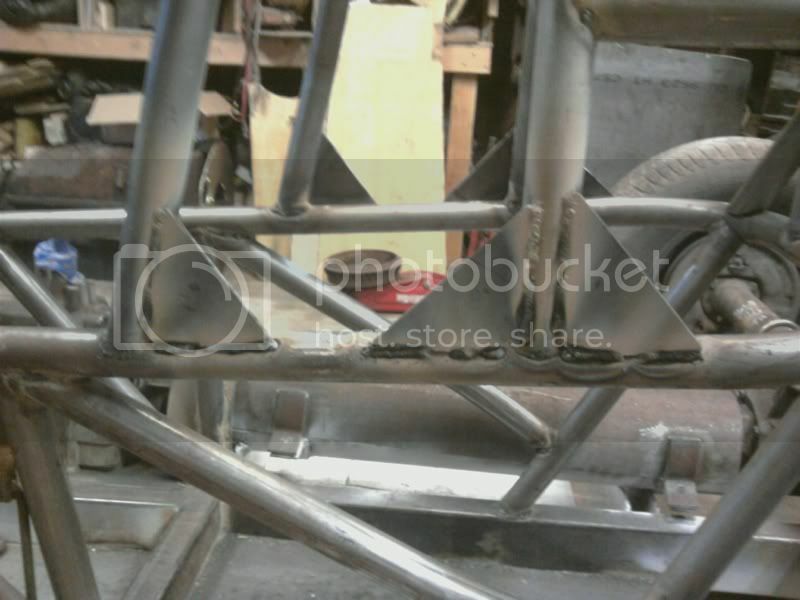 The cage has been started and welding to the firewall. The rear end is where it should be though not finalized at the moment. As well as that tube going between the trans and the rear is 7/16 wall, 6 inch tube. Since the drive shaft was going to be so close I wanted alittle more than a 2 inch, 1/4 inch thick strap of metal. If the drive shaft can escape my heavy duty tube, I am in a lot of trouble. I like your drive shaft "containment vessel"! Brutal but perfect! Your build is progressing well. Great build. I really like the simplicity of your T. Good job on the driveshaft tube. I had one break and fights its way into the car with me last year. Dodged a bullet so the floor is being replaced with a .120 13/4 tubing cage and .120 plate for a floor and drive shaft tunnel. I am loving this build also. I like that you are just getting in there and doing it. I hope you get it done for Speedweek. Alright, got some pretty good progress with the build, so I'll let the pictures do the talking. First I got the steering box in a place where I like it. No wierd angles from lock to lock. I tried to keep the steering geometry as simple as possible working with all 90 degree angles, accompanied by a heavy duty steering box mount. Next I am beginning to make a skeleton of what the body will look like. The nose won't be removable, but I plan on making everything else detachable for easy mantainence. You can also see the belly pan. The belly pan is the roof off of a van that my dad chopped off. Can't beat 14x6 feet of 16 gauge steel for 35 bucks! 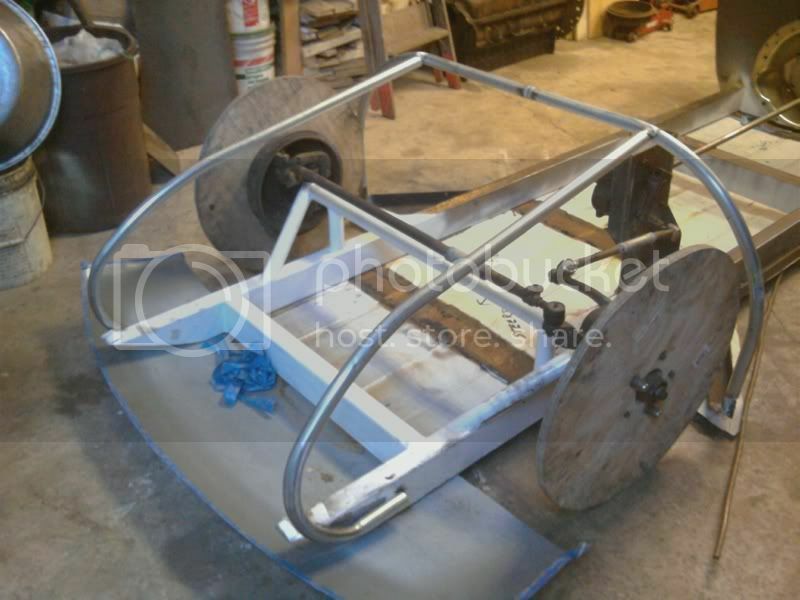 I've also put a lot of time into the roll cage and its almost complete, there are a few more pieces that will be put in there but what you see there should be all the rule book says I need. I just want to put in a few more things for comfort and strength. And the gussets, look just like the pictures in the rulebook don't they? So thats all the progress that I've made so far. Though I am sad to say that I probably won't be able to make it to SpeedWeek. I have the time and the drive, I just don't have the funds. Three major peices are going to hold me back; fire suppression system, personal safety things (suit, gloves, helmet and neck restraint) and tires. I have done the math and I wont make enough money to get to the big show, so I am shooting to have it out for World Finals this year which will also give me alittle more time to test and tune the vehicle. Got a few more pics of progress. A lot of the major stuff is in place or at least has a place to be, so it's all about the details. 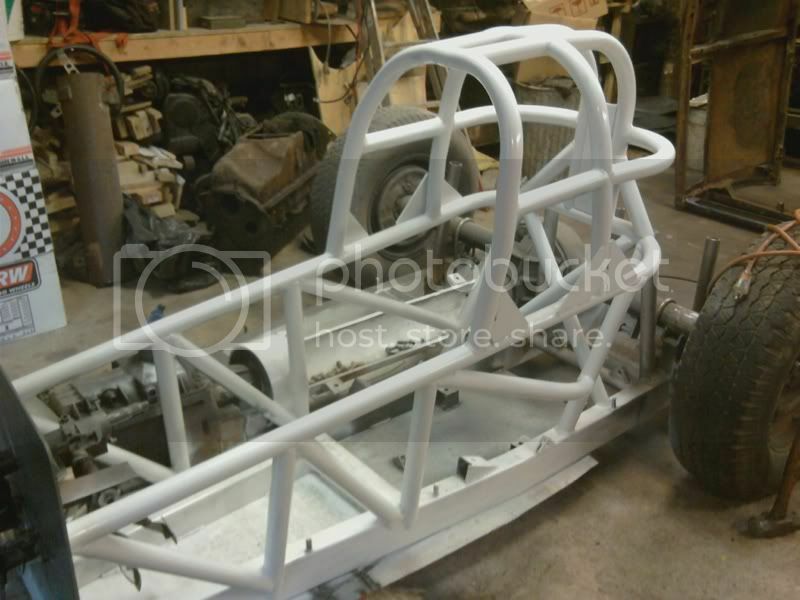 I finished the roll cage and painted it. I've also been working on the pedals. I have the clutch and brake master in place, as well as the clutch slave. I am waiting for the engine to be in place before I start working on the throttle pedal and linkage. 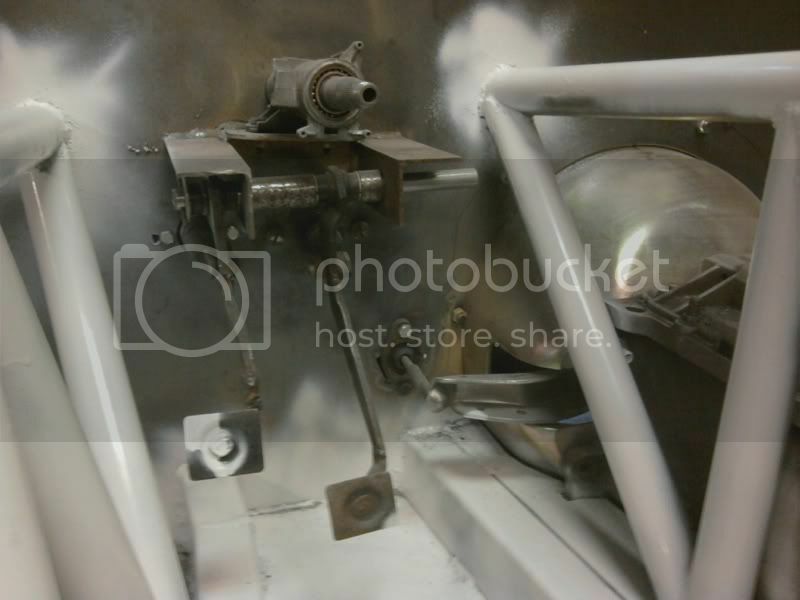 As you can see with the last picture the steering has made its way past the firewall. Its going to go alittle further to a quick release so I can get out of the vehicle easier. It's connected in front of the firewall as well, with a support along the way. Also the wheels with moon discs came in. 5 on 5.5 for ford lug pattern, fully welded, 15 x 4.5 wheels. Also got 1 inch lug nuts while I was at it. I've also been working on the trunk lid. It's made out of 3/16ths steel to the same shape as the original and will be bolted to a very secure frame with grade 8 bolts. This will allow me to bolt/weld a parachute and push bar (if needed) to it and still be able to remove the body and rear end. No pictures of that yet, it's still in the early stages of design. Looking at the front axle that's sitting on two towers, I think I would x-brace it side to side to assure it of no side loading.Just a thought.